So today was full of Max stories; I just had to share. I try to spend as much time as possible with my bestie. Since Max is like my shadow and goes just about everywhere I do, he spends a lot a time with her too. As an added benefit, he gets a lot exposure to kids - she has a 1 year old and a 3 year old. He isn't to the point that they can do anything to or near him without him reacting, but he has come a long way and they are some of his favorite people. Max is also very picky about taking food from people - he won't take food from most people and has to feel pretty comfortable with someone before he does. Katie's cute little baby was playing in the dog food bin today and Max was watching him play and then Collin started feeding him dog food and Max was eating it right out of his hands. It was so bonding and precious. While we were over there also, Reese, the 3 year old was playing hide and seek with me and was hiding. He doesn't like to hid for long - the anticipation of being found seems to get to him - and he will yell "Cerra! I am here!" and then I have to pretend to be surprised that I "found" him. So I try to find him quickly (I usually cheat and watch where he goes) but I missed where he went today. So I thought I would see if Max could find him. We have never done it before and wasn't even sure he knew which person was "Reese". But I said, "Max, where's Reese?" and gave him body language that indicated that I wanted to follow him. He was all about it. His ears perked and he took off immediately across the kitchen, through the entryway, and into the office where he stuck his nose in the curtain. At first I thought he thought I wanted him to get something outside and was trying to look out the window. But then I decided to look behind the curtain anyway, and there was Reese! I was so surprised and proud that Max found him so well! It was amazing!! I was giving Nolan some respite from Steve today, and before I took him back home for the bed, we decided to walk around the lakes in his neighborhood. They are a couple of man made lakes in his neighborhood. They are probably 1.5 miles around the two of them. Even though it was dark, it was still very hot. We were about 3/4 of the way done and 45 minutes in - Steve had to stop to rest a few times - and I thought I would try to see if Max wanted a drink from the lake while Steve sat on one of the benches. From where we were the water was about 1 1/2 feet from the concrete edge. There was a point a little down the way that looked like the cement was closer to the water, so I toddled down that way with Max. At this point, it was about 8 inches to 1 foot from the edge. Max has laid on the edge before and reached down to get a drink that far away, so I thought we could do that again. So I tapped the water surface with my hand where I wanted him to drink and said, "Get drinks" (his command to drink water). And in he went. He just walked into the lake! I was like, 'What the....?!?!?!' He instantly started swimming to stay afloat but started moving away from me too. So I grabbed the scruff of his neck. I just had his leash wrapped around itself around his neck, so if I pulled on that, it would cinch and probably hurt him. So I ended up pulling him out by his scruff and under his neck. It was successful and quick. Here's where it all went down. I usually don't like when people try to apply human emotion to animals, but I swear he was embarrassed. When he got out, he immediately sat down like he was just chilling but he wouldn't make eye contact with me. His face looked like he was saying, "Okay, let's never talk about this again... Can we just go now?" It was scary for a minute, but it was a very short time between when he fell in and when I got him out. So it was pretty quickly something that was hilarious to me. And his reaction made it that much more comical. Before he fell in, he was roaming around going in front of us, behind us, to the sides, sniffing things, strutting around (he knows he's allowed to do that on his retractable leash, BTW), and generally having a gay ol' time. After he fell in, he was in "super-heal" position. He would not leave my right side and his tail was definitely not up in the "grand ol' flag" of a position it was in minutes before. And since this is a desert we live in, we fill our giant, man-made lakes with secondary water, so we both reeked like fish crotch. After the initial shock of what Max just did wore a bit, I realized why he jumped in and felt a little sad for him. My brother's pool has a couple of spots that have steps that Max can get in the pool on and not be in over his head. I think it's hard to see in and be sure where the steps are for him, so when it looks like he's looking for them, I go tap on the water where they are and he steps in. I a pretty sure he wasn't listening to my words (not uncommon when he has new stimulation) and just saw that I tapped the water and automatically thought, STEP! And so he stepped right in. The trust I realized he displayed in me at that point in time was amazing. Luckily for me, Max really does like to trust me and I didn't let him drown, so hopefully that's not shattered due to the fact that there wasn't a step there. What a day! 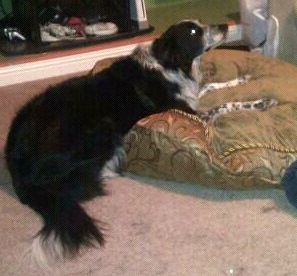 I love my Max!! 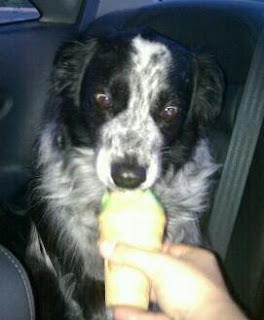 One for the road - Max makes the funniest face when I share my Thrifty ice cream with him. About a month ago, Nolan picked up his life in SLC and moved down here to help take care of Steve. He moved in to Steve's house and has been taking care of him and taking him to his appointments since. I have been trying to offer respite to him on weekends and whenever he needs it, but he has pretty much taken Steve off our hands. I cannot express my appreciation for Nolan enough. His decision to come here was internally motivated and purely selfless. He is one of the most special people I have ever met and a wonderful example of Christ-like selflessness. Thanks, Noli. We love and appreciated you more than you may ever know. While I normally disclose way too much information to way too many people, I don't generally, willingly bring up discussion about my medical conditions - especially those of mental health. While I am completely fine with the fact that I need medicine to balance chemicals in my brain, I am also aware of the many stigmas and taboos that society and individuals still have about those kinds of medicines. So I'd much rather not deal with the potential of being subject to people's prejudice based on this fact. So, what makes me bring it up? I'm glad you asked (..or not). I feel that it is worth the discussion to educate the general populous of the terrible effects of withdrawals from some of these medicines. I have been on several SSRI's and never experienced the terrible withdrawals that I do from the SNRI that I am currently taking - Venlafaxine (brand name - Effexor) - not to allude that there is less risk or intensity of withdrawals from SSRI's over SNRI's (I really don't know). The purpose of this post is not to try to talk people out of taking this medicine or others like it. Instead, I hope to offer information so people can make informed decisions. My prescribing doctor did not inform me of the terrible risks of taking this medication and, unfortunately, there are many others in my same situation. I learned of them the hard way and far too late to make an informed decision. There are some doctors like my old one, others that refuse to write a script for Effexor, and, I'm sure, everywhere in between. Do your research, ask your doctor specifically about the potential for SSRI (SNRI) discontinuation syndrome and effective ways they treat it, talk to people about it (feel free to contact me --->), and try to follow what feels right for you. I have been taking Effexor for 2 or 3 years now and am in trouble if I miss or sometimes even am late for a dose. Unfortunately, Walgreens has been the sole cause of some of these instances. (That may be a whole other post...). The effects of not taking this medicine are debilitating - completely live halting. I experience "brain zaps" (one of the worst feelings ever - I am so thankful for the internet because I would think I were crazy if others hadn't been there and given it a name already), dizziness, nausea, diarrhea (I know, you really really wanted to know that... sorry, full disclosure here), headaches, fatigue, and waves of chills or hot flashes. These have ranged in severity directly related to the length of time I have been without the drug. The most I have been without it is 2 or 3 days and have been rendered anywhere from noticeably impaired to completely and utterly useless and miserable - I have never been so sick in my life (and I had swine flu)! I missed my dose last night - usually taken around 10:30p - and took it just after 10a today. I have been sick all day - brain zaps, headache, dizziness, and nausea. I missed church and haven't been able to do much all day - this post took way too long to even write and I am sure it's littered with type-o's and errors. It's almost 2:30p now and I am just barely starting to notice relief from some of the symptoms - they are all still there, but some are less in intensity. The longer I go without after missing a dose, the longer it takes to recover from the withdrawal symptoms. This all said, Effexor has been the most effective of these types of drugs for me. I would have to say, though, knowing what I know now, I would never have started taking this drug. Again, I hope that this finds someone before they've made an uninformed decision. I am not a doctor, so find a doctor that knows these medications and can and is willing to help educate you in making a good, sound, informed decision about your health.